I have the honour of being nominated for the Liebster Award by allure de Vogue ! Thank-you for choosing me and I hope everyone else liking my blog just as much! Here is the actual definition of the Leibster Award and what it’s about. 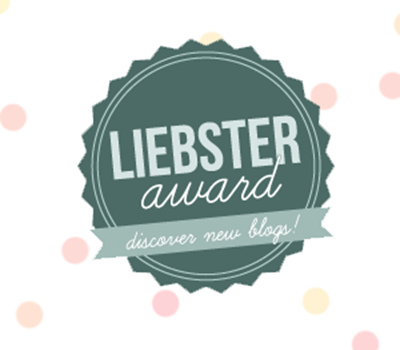 The Liebster Award: given to up and coming bloggers who have less than 200 followers. Liebster is German and means sweetest, kindest, nicest, dearest, beloved, lovely, kind, pleasant, valued, cute, endearing, and welcome. Isn’t that sweet? Blogging is about building a community and it’s a great way to connect with other bloggers and help spread the word about newer bloggers/blogs. 1. Answer the questions that the tagger set for you plus create 10 questions for the people you’ve tagged to answer. 2. Choose 5 people and link them in your post. 1.) Who/what is your favourite blogger/blog? 2.) What would be your dream job? My dream job would to be running an Event Planning company in any large city and putting a smile on people’s face whenever we through the perfect party or wedding! Any of my shoes of course….specifically though I may have to say my mint ring this summer, it goes with everything! 4.) At home, where is your favourite space? Curled up my the fireplace in our library under a blanket and some hot chocolate, the view is of our fields and it’s incredibly peaceful. 5.) Summer, Fall, Winter or Spring? SUMMER! Summer all the way, all the time. I absolutely love the sun and can never get enough of it, plus the fashion trends you can try in the summer are unbeatable. 6.) Who is your favourite actor/actress? Channing Tatum, I can’t resist his looks I’m afraid. I like too how he plays lots of roles and doesn’t just stick to your classic handsome looking good guy. 7.) What is your favourite trend at the moment? Patterns. Any type of patterns and also mixing patterns in one outfit. 8.) Candy, chocolate or veggies? Chocolate, hands down! I am a chocoholic and need my bit of chocolate after almost every meal. 9.) If you could travel to a place for any length of time, no cost & no plane hours where would you go? I would have to say Europe, I have yet to travel there and always see amazing pictures of people’s visits and it makes me jealous! 10.) What’s the best part of being a blogger? Being able to express yourself and your ideas in a way that evolves many different media (pictures, videos, text ect) and sharing them with people you may never get to otherwise. 1. What was your inspiration or motivation to start your blog? 2. What is your top item in your closet you can’t live without? 3. Favourite movie and why? 4. If you could have any car what type? 5. What is your daily makeup look? 7. What would be your ideal summers day? 9. Colour trends come and go, what do you think the next colour will be in fashion? 10. Best event or party you have ever attended?